Microbiologist John Jelesko has learned not to take any chances when he touches poison ivy. Poison ivy can grow as a creeping vine on the ground. Poison ivy can take over a dead tree, like this one on the Virginia Tech golf course. From afar, it looks like it could be an evergreen. Up close, it becomes clear that this is a nightmare of nature. (From top left clockwise) Poison ivy with smooth edges; jagged edges; round leaves; notched leaves. All pictures were taken on a trail in a state park on Tennessee's Cumberland Plateau. The Virginia Tech professor was cutting up a downed tree with an electric chainsaw. What he didn't realize was that his power cable had been dragging through poison ivy. So at the end of the day, as he coiled the cord around his palm and elbow, he inadvertently launched a career-bending science experiment. "Within 48 hours, I had your classic case of poison ivy on my arm. And as a scientist, I said, 'This is interesting, how bad can it be? I'll just leave this untreated,' " he recalls, sheepishly. "In about two weeks, I had learned just how uncomfortable poison ivy rash could be." Uncomfortable sounds like an understatement. Jelesko says he barely slept while fighting the urge to "claw my itching flesh off." Eventually, he went to his family doctor, who prescribed oral steroids. The experience sparked years of research into a plant he calls a "familiar stranger." He has studied the chemical, urushiol, that triggers that tell-tale rash, and the plant's biology overall. The tricky thing about avoiding poison ivy, Jelesko says, is the plant is highly adaptable and can take many different forms in different environments. "It's remarkable," he says, with a laugh. "There's just an enormous amount of things with this plant that are currently unknown." 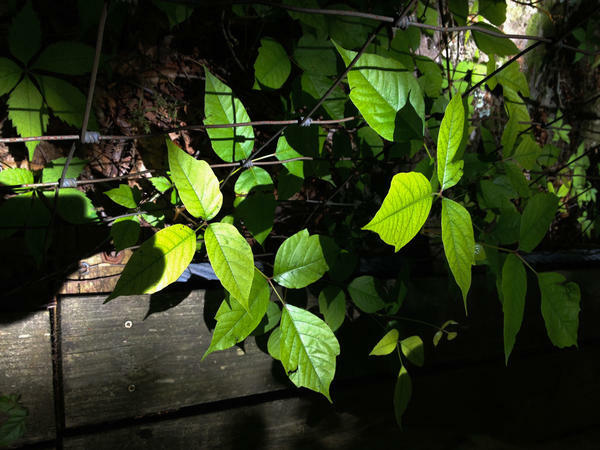 Here he offers insights into how to recognize Toxicodendron radicans (the plant's scientific name) before you risk touching it — and what to do when it's too late. The axiom, "leaves of three, let it be," is accurate, says Jelesko, but those leaves can come in many shapes, even on the same plant. You're safe if the plant has thorns — poison ivy doesn't, but it does sometimes have little pale green berries. Another tricky feature of the species that can trip up passers-by: Poison ivy plants can grow in many shapes and sizes. When mature vines climb up a tree, their shape can even mimic that of the host tree. Simply pushing aside an innocent-seeming branch could make you pay a few days later when the rash begins to well up. Jelesko's latest research, which is not yet published, finds that, in cities, poison ivy tends to grow as a climbing vine, whereas out in the forest, most of the plants are ground-creeping vines. 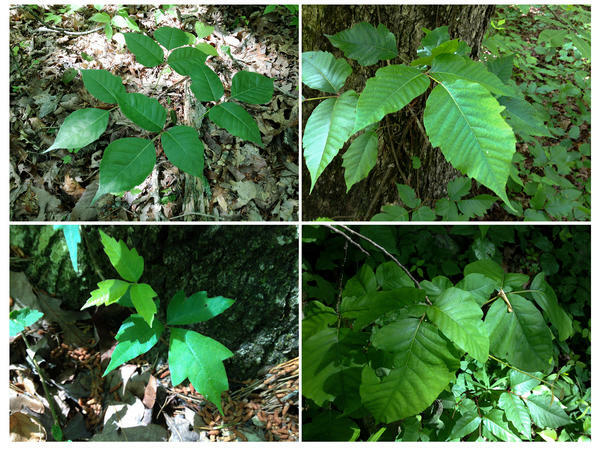 And poison ivy is much more prevalent in "landscapes modified by humans" than out in the middle of the woods. If you think you've touched a plant, or unfortunately know you have, follow these tips to alleviate the problem. Of course, prevention is the best route. 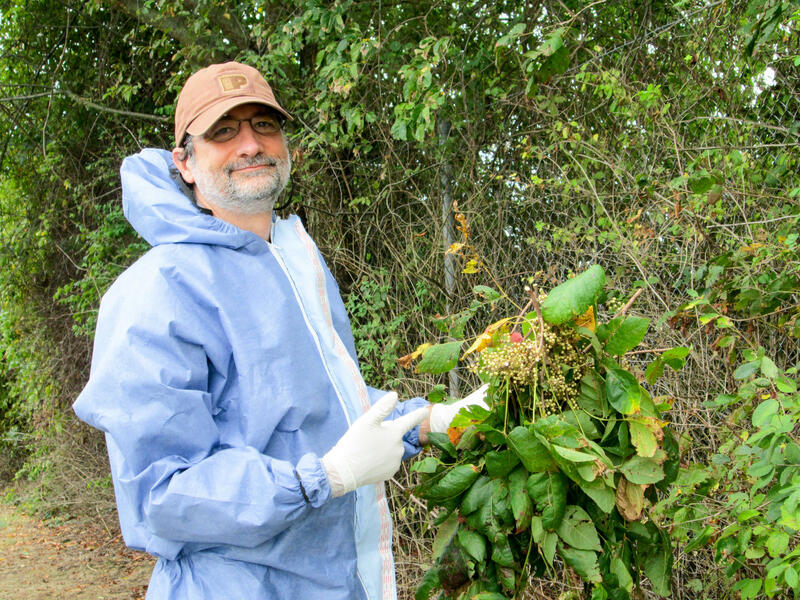 John Jelesko now dons a Tyvek suit and two pairs of gloves when he's wallowing in poison ivy. To confirm you touched poison ivy, you can try what's known as the "black dot test" — but proceed with caution! With gloved hands, tear the leaf in half, put the sap on a piece of white paper. If it's poison ivy, the urushiol oil will turn black in 30 minutes. This is the same reason black dots appear on some of the plants. Keep an eye out for a streaky, red rash in the first few days, especially if you've had a poison ivy reaction before. For poison ivy newbies, the rash could take a week to develop. Repeat customers can start breaking out in a day or two. Rather than building immunity, multiple exposures can make someone more sensitive, priming the immune system to produce a more "robust" response, Jelesko says. Steroids and anti-itch medicine don't always solve the whole problem and medicine has little else to offer. (If you're still in agony, cold compresses or a bath with oatmeal may help soothe your skin.) But more medical help may be on the way: Scientists are in early days of exploring new treatments. A researcher at Duke University found that part of the body's response involves an inflammatory protein "exciting" the nerve fibers in the skin and sending itchy signals to the brain. An antibody that counteracts the protein is currently in a clinical trial with humans. If your pup came along with you on the outing that exposed you to poison ivy, never fear. Dogs are not allergic — but their fur can definitely hold the oil and transfer it to their owner, so have care with petting your dog after hiking past poison ivy. Scientists haven't found many animals that break out like humans do, though lab mice seem to be allergic enough for research. And just in case you weren't disturbed enough by the proliferation of this itch-inducing vine, behold and be amazed by this king of the forest, a vine that's truly awe-inspiring in size. Happy hiking! The best way to keep poison ivy away is never to touch it. An old saying is meant to help. If it has leaves of three, let it be. But it's not that simple. Here's Blake Farmer of our member station WPLN in Nashville. BLAKE FARMER, BYLINE: Every year since she bought her house in east Nashville, Sara Weedman ends up nursing a nasty poison ivy rash. SARA WEEDMAN: This time, I actually had it on my neck and my face, which is a first. FARMER: She's already been to get a steroid shot, and she's enduring scalding hot baths, though the relief is temporary and not recommended by doctors. Weedman blames her repeated rashes on her inability to spot poison ivy. WEEDMAN: I've kind of become afraid of my own yard because it's a miserable feeling to have poison ivy. I mean, it's been two weeks, and my ankles still itch. FARMER: Purely out of self-preservation, I developed an eagle eye when it comes to PI - what we called it in my landscaping days. We walked down Weedman's chain-link fence just a few steps and bingo. You see this right here? FARMER: Now, that is some funky-looking poison ivy, but that is definitely poison ivy. This plant has so many different looks, even occasionally on the same vine. And while the leaves do come in threes, some have smooth edges, others are saw-toothed. Still, others have angular lobes. They look almost like a mitten. They're shiny. They're dull. Virginia Tech microbiologist John Jelesko is one of the few researchers as fascinated as I am. JOHN JELESKO: In fact, in general, we call this plant in the lab the familiar stranger. 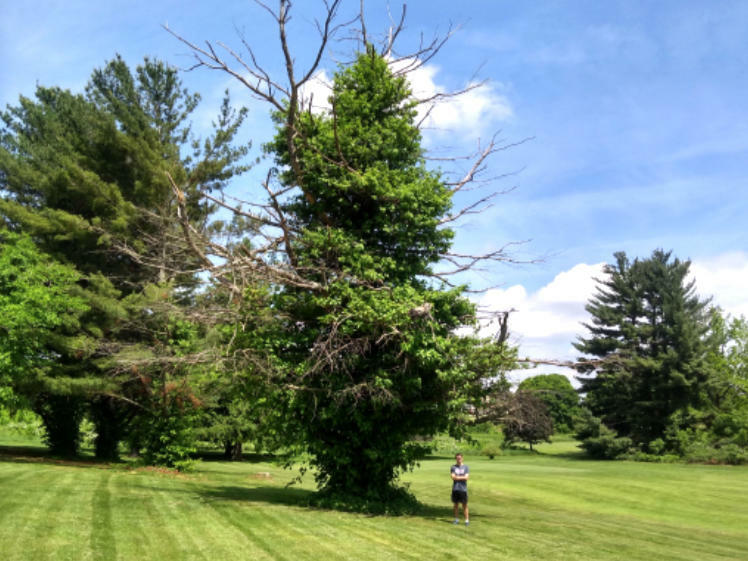 FARMER: Even Jelesko, who specializes in plant-generated chemicals, realized he didn't know much about it until 2012 when he had his own run-in cutting up a tree with an electric chainsaw. When he coiled up the cable, it was covered in poison ivy, and the active ingredient, urushiol, got onto his arms. The next day - a red, streaky rash. JELESKO: My response to this was, oh, this is kind of amusing. Let's - you know, let's see where this goes. How bad could it be? FARMER: And so began a career-bending science experiment. JELESKO: Well, this initiated about a 2 1/2 week odyssey of lots of itching and not very much sleep. FARMER: During those long nights, he dug into the scientific literature and realized there wasn't a whole lot. So he started cataloguing the variety of leaf shapes as well as the varied plant forms. The weed is native to much of the U.S. A very close cousin, poison oak, is found in western states. It can grow in many shapes and sizes. It appears in big mats on the ground. JELESKO: It can also grow as shrubs. FARMER: Scariest of all is when poison ivy climbs. It can grow so large that the vine puts out branches that intermingle with the host tree. Jelesko says the best thing to do when you get snagged is wash with sudsy dishwashing soap, but do it quickly. JELESKO: This chemical will actually chemically crosslink itself to your skin. Once that happens, there is no amount of washing with soap that is going to take that off. FARMER: After the damage is done, there are many a home remedy, from cold compresses to Clorox. Steroids and anti-itch creams help but aren't totally effective. Researchers at Duke University have found an antibody that offers some relief but is not yet ready for humans. The only way, really, to avoid misery is prevention, but don't stay inside. Just study up. For NPR News, I'm Blake Farmer in Nashville. Transcript provided by NPR, Copyright NPR. 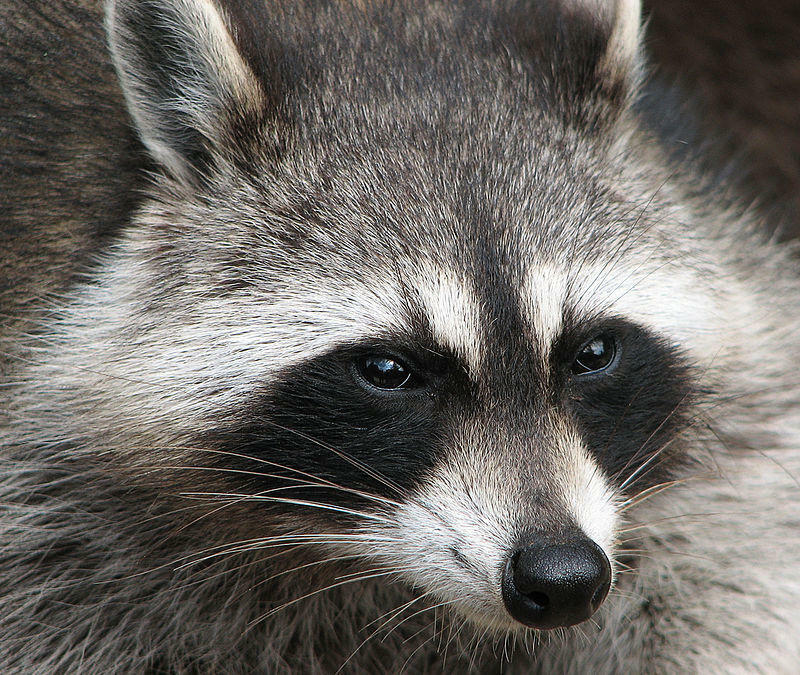 Health officials say a raccoon has tested positive for rabies in West Virginia. According to news outlets, the Monongalia County Health Department says the raccoon was found Monday in the National area of the county. Tests confirmed the disease in the animal.